Get ready for a very special installment of Inner Moonlight! 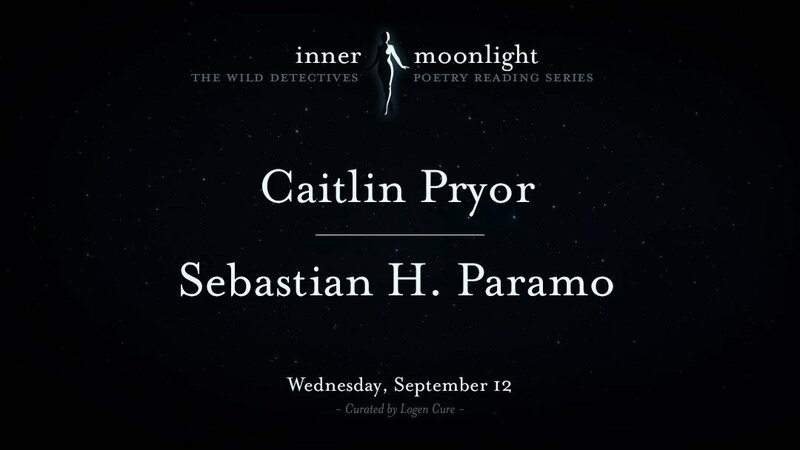 We are happy to feature Caitlin Pryor and Sebastian H. Paramo. Brief open mic to follow. Caitlin Pryor’s poetry, fiction, and nonfiction have appeared in Pleiades, Gulf Coast, Boxcar Poetry Review, SmokeLong Quarterly, Entropy, and elsewhere. She holds an MFA and Ph.D. in Creative Writing and is currently seeking publication for her first full-length collection of poetry. She has recently accepted a position as Director of International Tours at Blue Lake Fine Arts Camp. She now splits her time between Western Michigan and North Texas and will perform alongside her partner, poet and editor Sebastian H. Paramo. Sebastian Hasani Paramo is the son of Mexican immigrants. His work has appeared in or is forthcoming in Salt Hill, Pleiades, Huizache, upstreet, North American Review, & other places. He is the Editor-in-Chief of THE BOILER. He has received scholarships and awards from Sewanee Writers’ Conference, Bread Loaf Writers’ Conference, and the Vermont Studio Center. He holds an MFA from Sarah Lawrence College and lives in Denton, Texas as a PhD candidate at the University of North Texas, where he is the Managing Editor for American Literary Review.